DAVOS, Switzerland (AP)  As the worlds financial and political elites convene here in the Swiss Alps for the World Economic Forum, their vision of ever-closer commercial and political ties is under attack  and the economic outlook is darkening. Britains political system has been thrown into chaos as the country negotiates a messy divorce from the European Union. A year after getting a standing ovation from the elites at Davos, French President Emmanuel Macron is sinking in the polls as he contends with yellow vest protesters who have taken to the streets to call for higher wages and fairer pensions. Nationalist political movements are gaining strength across Europe. Judging by the state of the world right now 10 years on from the financial crisis, and the dysfunctional state of global politics I would suggest that these annual events have achieved the sum total of diddly squat, said Michael Hewson, chief market analyst at CMC Markets UK. For most of the past quarter century, the worldview symbolized by the World Economic Forum  of ever-freer world trade and closer ties between countries  had dominated. Then came a backlash from Americans and Europeans whose jobs were threatened by low-wage competition from countries like China and who felt alienated at home by wealth inequality and immigration. First among them, perhaps, is WEF founder Klaus Schwab. In an interview Sunday, he stressed the need for more global, forward-looking cooperation and a human-centered approach to technology as populism feeds on fears of a possible economic downturn in many parts of the globe. Globalization produced millions of winners over the years, but also has left certain people behind, Schwab said at the Davos conference center, where his teams gave pre-event tours to delegations ahead of the formal start on Tuesday. In the age of social media, you cannot afford any more to leave anyone behind, he said. Access to the elite gathering, for businesspeople anyway, doesnt come cheap. It requires WEF membership, which starts at 60,000 Swiss francs ($60,259) and rises up to the Strategic Partner level at 600,000 ($602,605). Getting into the Davos event requires an invitation and an extra fee, which WEF spokesman Oliver Cann said is 27,000 francs ($27,117) per person. Thats just for corporate chieftains. Civil society, non-governmental groups, U.N. leaders and governmental officials dont pay: They get in free. Lodging during high-rent Davos week, however, is another matter. Although Davos is seen as a redoubt for global elites, populists have come, too. Trump got a polite reception when he showed up in 2018, and he had planned to come again this year before the shutdown intervened. Brazils newly installed president, the populist Jair Bolsonaro, will attend this year. 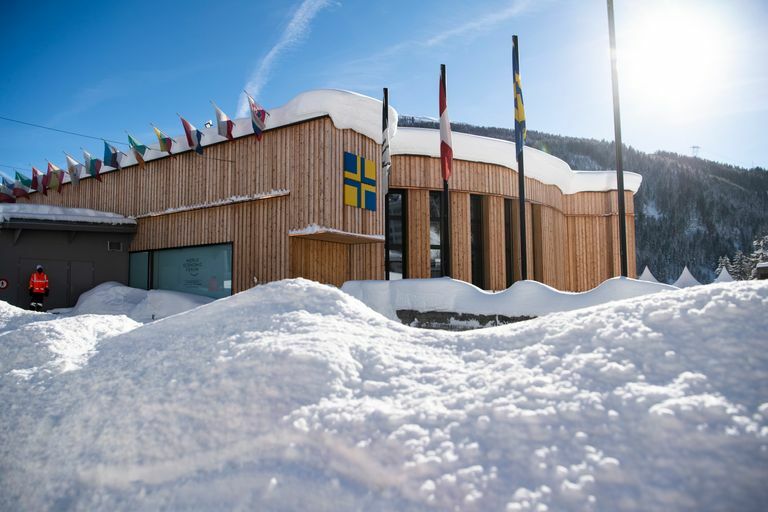 Davos serves as a global stage for world leaders and executives, and the conference center transforms into a warren of public and private meetings. Executives talk possible deals. Government leaders either meet and greet each other or seek to iron out differences  mostly quietly. Academics and chiefs of non-governmental groups speak out in webcast panel sessions or comb corridors looking to rub elbows with decision-makers. In a report this month, Sterne noted that most major economies performed dramatically worse than expected after the 2007-2009 Great Recession. He blames many central banks  besides the U.S. Federal Reserve  for not responding to sluggish growth more aggressively with easy money policies. And, Sterne says, politicians should have juiced growth with tax cuts and higher government spending. Sterne worries that the populist response could trigger radical and ill-conceived policies that overshoot and drive up inflation and swell government budget deficits. The ride could get even bumpier. The World Economic Forum is focusing on what it calls the Fourth Industrial Revolution  a series of rapid advances in technology and medicine expected to transform society. Advances in robotics and artificial intelligence could further threaten jobs and feed the populist revolt. Crappy economic policy, easy money. Inflation is a tax.